Worcestershire youngsters dressed up in onesies for the day – for an unusual lesson in information communications technology (ICT) from the Superfast Worcestershire partnership. The children, who attend Bredon Hancock’s Endowed Church of England First School, were learning about some of the technology behind the Superfast Worcestershire programme, which is being led by Worcestershire County Council and BT. The multi-million pound roll-out of fibre broadband – which is part of the Government’s Broadband Delivery UK (BDUK) programme – is using a range of technologies to ensure as many properties as possible are able to access faster fibre broadband. 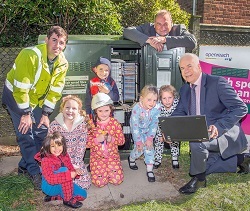 As well as the conventional fibre broadband road-side cabinets, Superfast Worcestershire are also building around 80 ‘all-in-one’ cabinets, known as ‘onesies’, which are used to connect some of the county’s more remote communities to the fibre network, including parts of Bredon. The children were given an insight into how the technology works by an apprentice from Openreach, BT’s local network business. They were joined by Councillor Adrian Hardman and representatives from the Superfast Worcestershire partnership. As well as Bredon, fibre broadband has recently gone live in additional parts of Badsey, Birtsmorton, Hartlebury, Hillside, Kidderminster, Ombersley, Pershore, Redditch, Rock, Stoulton and the Cross area of Worcester. Elsewhere, areas of Cotheridge, Eardiston and Severn Stoke are now able to access faster fibre broadband for the first time as a result of the programme. More than 62,000 homes and businesses in the county can now order faster fibre broadband as a result of Superfast Worcestershire. The figure increases to around 243,000 when combined with private sector investments by companies such as BT. County councillor Adrian Hardman said: “It’s great to see new and innovative technology being used to support the fibre roll-out in Worcestershire. “Our investment in bringing faster broadband to rural areas is fast becoming a reality for many in the county. Residents and businesses will be able to take advantage of faster internet speeds and all the benefits this brings both at home and in the workplace. Paul Bimson, BT’s regional partnership director, said: “Fibre broadband is transforming the way people of all ages use the internet. Whether it’s children going online to do their homework or to play games, or parents using it for internet shopping or catch-up TV - everything is easier, better and faster with fibre broadband.